February officially marks my 12-year anniversary as a Certified Personal Trainer (CPT). I repeat. 12 years! Whoa. Despite having a B.S. in Exercise Science, I’ve made it a point to receive and maintain my credentials, in addition to adding a few new ones, over the years to stay current with the research and trends. It’s an ever evolving field— health and fitness— and I love that! Coincidentally enough, February is also my Strong Like Her LLC anniversary. And what an incredibly humbling and amazing ride this past FOUR years have been! I’ve said it before and I’ll happily say it again…if it weren’t for the support and encouragement of my clients (as well as my now husband) who recognized my potential as a leader in this industry way back in 2014, I wouldn’t be where I am today. Period point blank. Angela, Brenda, Cassidy, Sharron, Thalia… y’all stood strong with me then and continue to today. It feels truly special to have built something that has impacted so many people over the years. Something that I genuinely enjoy doing day in and day out. That whole “your vibe attracts your tribe” thing is real deal. My clients are uber fabulous and bring so much joy and inspiration to MY life— how many people can say that about WORK? However, while working from home has had it perks, it’s ultimately still rather limiting. I’ve outgrown the garage and need more…more space to operate on a bigger scale in order to impact more people as I continue to strive to achieve more dreams, many more. What’s New at Strong Like Her? 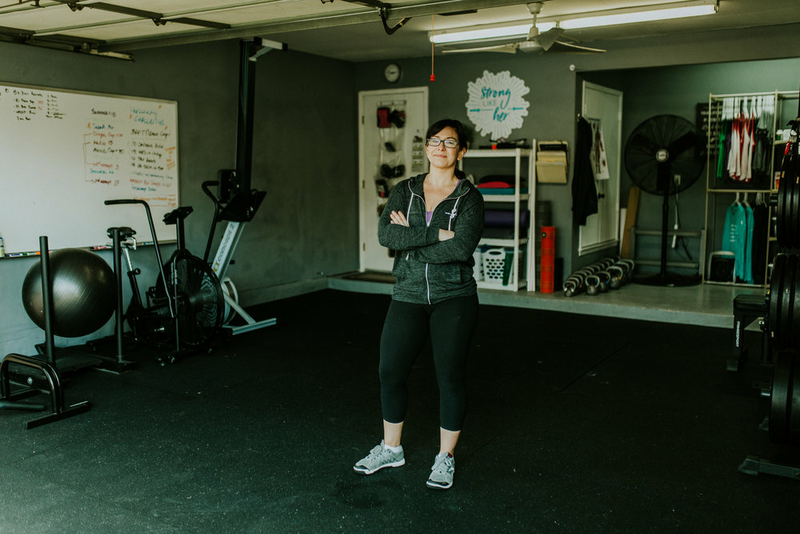 My husband, Bane (also an independent trainer), and I have joined forces to pursue OUR dream of opening a gym that will offer a regular group class schedule and personal training services, HILL COUNTRY MVMT. Hill Country MVMT (read: Hill Country Movement) is a fitness collective in Dripping Springs, Texas where our goal is to cultivate a community that MOVES WELL and MOVES OFTEN, forging strong, resilient bodies; ultimately assisting our members in achieving physical autonomy. it’s not about the weight you lift, but the people you move. we value a community that connects with movement, yet celebrates unique achievements without comparison, allowing each individual to define success by standards that meet their individual needs and goals. This has been a long time coming and feels like the next, natural progression in our business(es). To say we’re thrilled is an understatement. Because Strong Like Her has been my baby these past four years, it’s not going anywhere…not figuratively anyway. Strong Like Her is moving into Hill Country MVMT, effective March 2019. Undoubtedly, I will continue to work with a women’s niche, just under a new roof and in a new city. I’m excited to be able to offer small group training again in our 1,800 square foot workout space where we’ll have more wiggle room to flex— a bit of an upgrade from 600-700 square foot garage! I’m bringing back the Strong Like Her BOOTY CAMP program series! Booty Camp will be offered as a month-to-month membership (i.e. no contracts) at Hill Country MVMT every Monday, Wednesday and Friday at 9:00-10:00a. This specialty program is a women's only class series that focuses on forging fundamental strength, stability and conditioning with an emphasis on developing GRIT & GLUTES programmed for and by women. If building strength while building community and camaraderie among like-minded ladies sounds like your jam, join me at Hill Country MVMT! Booty Camp classes are scheduled to begin Monday, March 4th. Whether or not you’re able to JOIN THE MVMT at Hill Country MVMT in person, we encourage you to follow along with our new mission of Redefining Success with us in spirit! You can do so by checking out our Facebook and Instagram pages and/or sign up for our mailing list when you hop on over to our new website. Finally, special thanks to every single client I’ve had over the past 12 years for trusting me with your journey! Your support means more to me than you’ll ever know. A little look back over the years, from corporate fitness and my first ever personal training client, my boss, coworkers, members and teaching group fitness to life in Austin where I ditched running races for figure shows and CrossFit and became a full-time trainer. With Chency, my 1st PT client! My boss at HealthFitness, Keli. Laura, a co-worker at HealthFitness. At a Les Mills Quarterly event. With "Little Laura", another co-worker. Teaching Body Pump at Aramark! A few fave members from Aramark's gym. They threw me a moving away party my last day! I received an MVP award from 24HF. With my coach, Teri, 2013. My first rings muscle-up, 2014. At the CrossFit Games, 2014.